Though yesterday was the official kickoff for the River Stole, I really didn’t want to start it until I finished these babies up. These were pretty easy and quick to knit up and it only took one skein (since I didn’t care if they matched up or not). I only wish that book publishers weren’t so cheap when it comes to printing charts. Would it have been that hard to also print up the left armwarmer one? I really like the Diakeito, it’s really soft and the colors stripe in a nice, soft way. I can definately see myself wearing these come fall, especially since I hate wearing gloves when I drive but hate having to grip a cold steering wheel while waiting for the heater to kick up. Did you notice that bright yarn up above? I finally broke down and got some Vesper Sock Yarn in Aqua Melon. 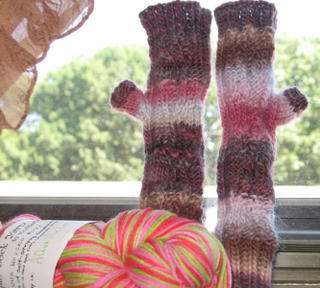 They are destined to be some funky, yet simple socks for yours truly. I was hoping for a colorway with pink and brown, but no such luck. Just pink and lime, blue and orange, and the “knit and tonic” one, which is pretty but I would feel a little weird knitting something up in someone else’s blog colors. There’s something groupish about that. Tonight the boy and I will be driving up to his parent’s house for the loooong weekend. I’ll be taking the beginnings of River and the yarn for the second caribbean sock. I’ll try to blog while we are up there, but I always go up with such plans and somehow I never get to do any of them. Wish me luck! How gorgeous! I do love that yarn!So is this *the* trip? The armwarmers look great. I’m in love with that sock yarn! The colors really pop! omg. I LOVE THEM. LOVE LOVE LOVE them. They look WONDERFUL. Now I want to make them so badly!Was the cabling hard at all? 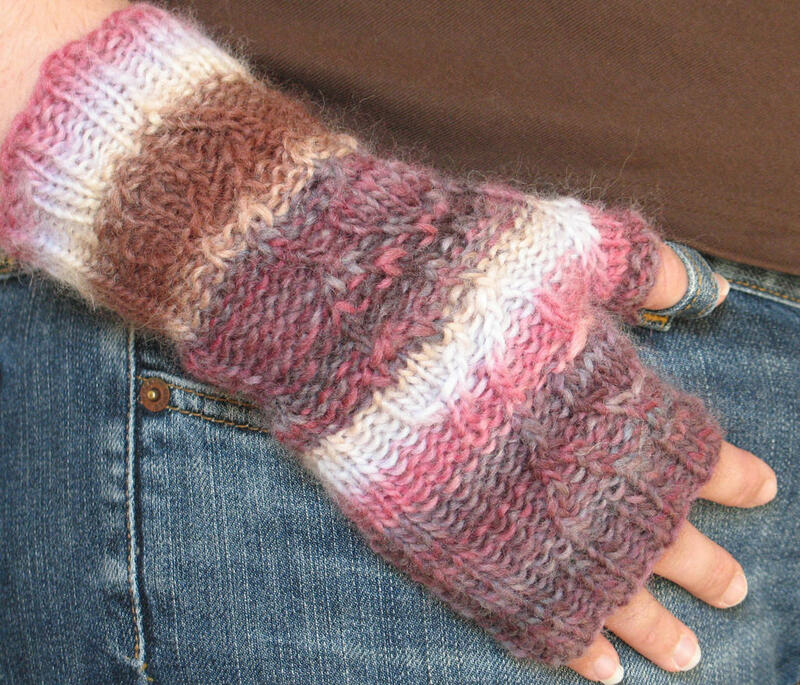 I was thinking about making these for my first “cabling” project.I hope you have a lovely long weekend and I cant wait to see what you do with that bright sock yarn!! in the first pic, the arm warmers look like colorful little trees! they are very cute. I have been mulling over the idea of a pair of hand warmers. I will be going to school in S.F., it’s already pretty cold over there! !have a great weekend!! Oh WOW ! They look so great on your hand lady !! Enjoy your week end..! i’m totally drooling over the armwarmers. and i’m with you on cold steering wheels. hope you had a nice long weekend! love them! the yarn and pattern are perfect together. I just knitted the same ones but out of Noro. I have the same thing about the steering wheel while waiting for the heater! Not to mention the heat at my school is sporadic and those classrooms are bloody cold in the winter! Your arm warmers came out great!